Donald Trump pulls no punches. He never has, and he likely never will. On the issue of illegal immigration, he has been consistent in his rhetoric that unchecked, unvetted access into our country brings criminals. His new ad targets that point directly, and it has the left and some members of the GOP in a tizzy. Remember the 1988 presidential campaign? President George H. W. Bush (then vice president) was running against Michael Dukakis who was the governor of Massachusetts at the time. One of the major issues where Dukakis was soft was crime, and the Bush campaign produced the famous “Willie Horton” ad. This ad was hard hitting, and the media criticized it as racist. The facts regarding Horton were plain to see, yet the media were more concerned about perceived racism than the stupidity of granting weekend passes to a convicted murderer. Fast forward to President Trump and his latest push to stop the caravan that’s working its way to our southern border. Trump took to Twitter this week and endorsed an ad that focuses on Luis Bracamontes, a twice-deported cop killer from Mexico. Bracamontes was in the U.S. illegally when he killed two California law enforcement officers. Not only did he show no remorse, but he laughed and smiled when he talked about killing cops. Hard-hitting but accurate. The fact that Bracamontes was deported during administrations that span both Republicans and Democrats shows that addressing illegal immigration has been a failure for both parties. But there is no doubt that the Democrats want to open up the southern boarder to everybody. An unchecked flow of potential future voters is the only thing on the minds of Democrats and those in the media. The ad specifically references someone accused of murder. Other members of the caravan have gone on camera and stated directly that there are criminals among the travelers. As reported by The Washington Times, Trump addressed his critics and did not step back from the ad. President Trump rejected Democrats’ accusations Thursday that his latest campaign ad on illegal immigration is similar to the racially tinged Willie Horton ad of a past presidential campaign, and said his team has more potential ads highlighting brutal crimes by immigrants. So there you have it. Hundreds of criminals are reported to be in the caravan, and yet the left just wants to let everyone in. It’s insane, and yet President Trump is the one taking the heat. The solution is to tell the migrants to look for any house with a Democrat sign in the yard. Those households will not vet you, but will welcome you with open arms. How do you think that will go over? You can color it any way you want, but it’s still WAR against the USA. Huh? What credibility or authority does a newspaper reporter have?? They are but a bunch of non-creditable story tellers that are protected by the Constitution and they can write whatever they want and none of it has to be true or factual. So what or who gave these lying storytellers the authority to dictate what the President of the United States says or does? When I read a article published by CNN, I know it is fiction and I read it for entertainment only, they are but looney tunes. Add to that, when we’ve seen NEWS STORY AFTER NEWS STORY, about illegal invaders KILLING AMERICAN CITIZENS< exactly where is the 'falsehood' in what Trump's ad is saying? If they were in an uproar that the ad wasn’t far harsher than the Willy Horton (which was about a US-citizen felon — and not invaders even more malfeasant), it could be considered reasonable…. The issue of Willie Horton was first used against Dukakisote in the Democratic primary. The notion that proof of criminal presence in the invading mob is necessary is absurd and if public officials strike that pose they are derelict of duty. The caravasion consists of unidentified people who want to cross the border either by sneaking in, confronting border officers with false claims, or using violence to beget sympathy to change policy. And with the # of news articles JUST THIS YEAR on illegals killing US citizens, that alone shows “pushing for unfettered access to our country by illegals” SHOULD BE TREATED as being accessories TO everyone of those murders. One must assume these “unidentified people” are criminals of the very worst sort. At best, they’re filthy freeloaders. They most certainly are NOT seeking asylum from their oppressive home country. If they were, they would stop in Mexico. So don’t even try to paint these people as refugees. They’re not. Whether in dollars or lives, they plan to make America pay when they get here. Don’t let them get here. Ever. Foul al gore used the “willie horton” ad first in the dem primary just like hill the shill clinton was the origin of the obama “birther” question. When the R’s use their own primary ads against them, they whine and the media covers for them. 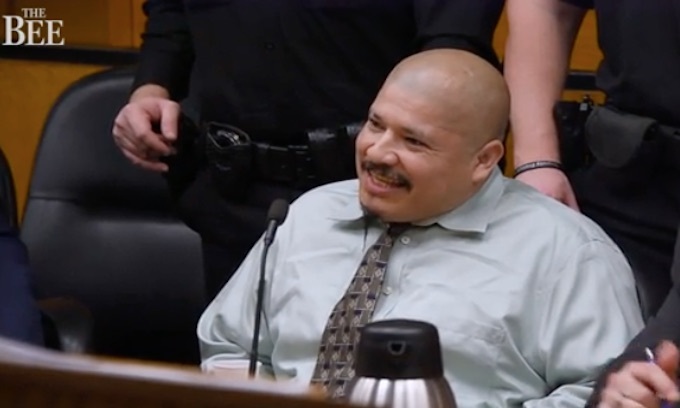 And when you have this savage, GLEEFULLY celebrating his killing of cops, in a court room, WHY SHOULDN’T trump use his own words against him!! Basically a small army of looters heading our way. The left leaders are betting that their gated communities are immune to the violence they are counting on. When chaos is the order of the day these are the first places to look for hiding felons. Ditto those who harbor illegals and incite mass invasion. B) being accessories to every crime those aliens perform.! The left loves their criminals! It’s easy to tell by the reaction of the Liberals how totally TRUTHFULL the add really is. Democrats don’t care about oppresed people, or people desiring “political asylum”, they just want POWER! If that means we have to let in murders, rapists, drug smugglers, and leeches, so be it, but don’t kid yourself; this is NOT a human tights issue. It’s a voter issue, a power issue. How many of these Uber-Urban, Uber-Liberals are going to hire immigrants? None! And the part i find moronic, is so many liberal voters, just can’t or WON’T see just how little the Dems value them. THEY VALUE felons and illegal invaders, MORE THAN they value US citizens. YET millions of citizens will still vote for the dems. There. I just summed up everything a Lib has to say for the next year. You can safely tune them all out now. Well said. Though i’d have used “WHAAA” before every line item. As Rush one said: Liberalism IS a Mental Disorder!!!!!!! PERIOD!!! Actually, that was Michael Savage who wrote a book titled “Liberalism is a Mental Disorder.” Rush has said something similar, though. And so have many folk here! Any person in America that is offended by the ad is a fake American and you should ignore them like junk mail !! So Demon-Rats are offended by the Truth. That’s why they constantly LIE AND DECEIVE!!! I really do believe that the Democrats would gladly exchange one human life for one Dem vote. I think they’re that callous and that evil. They already exchange the killing of ~ 1,800 individuals per day in the US [abortions] for a few votes; so why should the Demoncrats change. They merely follow their master: the father of lies who comes to steal, kill, and destroy. This horde of South Americans coming up and waving their country’s flag, saying that they will not be stopped at the border, what does this sound like! I’ll tell you what it sounds like it sounds like the nazis invading countries in Europe minus the tanks and planes! It certainly sounds and LOOKS like an invading force to me. Not too far left liberals, it is only the power that the illegal votes will bring down the line in the near future. They have been working on taking over the USA since they blew it just after the VN war in the mid-70s. At that point, they started teaching the teachers of the last decades while changing History to meet their agenda. If you look at all the colleges and universities you will be hard pressed to find anything but liberals verging on Commies teaching our kids. Now many of them are teaching in the schools from grade school up. Ever wonder where all the PC crap comes from, our kids being indoctrinated from 1st grade thru graduate school. The racial / ethnic background of a criminal is of no significance. Any policy that fails to punish criminals is “soft on crime” by definition. All illegal aliens are criminals and thus all must be punished; not rewarded with bi-lingual education, free housing, free lunches, welfare payments, and voter’s certificates. That is true. BUT the worse part here, IS IF THIS savage scumbag had not been allowed into the US after being deported once before, he wouldn’t have been here, to commit his heinous crime of killing two cops. The thing wrong about the country is that the Fake News are allowed to get away with treason! They have turned so vile against this president and his efforts to regenerate and protect the country from Obama’s 8 yrs of destructive policies and I’m surprised that even some Fox people criticize Trump! I’m not fearful but I am damn mad that anyone, but especially an elected representative, has the stinking nerve to literally hold up both their middle fingers to American citizens by stating that they in any way support permitting ANY unidentifiable and unvetted foreign nationals to roam freely and unsupervised within our country under any circumstances, kids or no kids. We already have 20 million + unvetted foreign aliens thumbing their nose and living here quite openly. If they are living here illegally and presumably working with stolen or fraudulent documents or have committed any type of crime or for whatever reason are already on the books as subject to deportation then they need to go, period. If we need workers, then should be able to get them from the 1 million plus that have been vetted and are being admitted legally EACH year. Time for another Eisenhower operation whereby he had 1.3 million illegal aliens rounded up and deported with approval of both political parties. Eisenhower managed this without phony screams of horror and cries of racist heartless monster from totally irrelevant know-nothing media and without bogus nonsensical lawsuits from seditious and / or militant left wing groups or lawyers who are likely being funded by drug money or foreign govts or human traffickers to do whatever necessary to keep the border wide open for anyone or anything to easily get into US interior. And when many of them unvetted folk, are walking around, using FAKE/STOLEN IDS to defraud our tax dollars, that COMPOUNDS things, that these moron mayors stick up for THEM over US. That is why i keep saying, EVERY TIME, an illegal invader one of these mayors ‘gives sanctuary to, commits a crime. WE SHOULD BE ARRESTING and charging that mayor as an accessory, OR an accomplice. WHICH ever is the harsher charge. Bracamontes should have been executed for what he did. The left hate the fact that President Trump is NOT a Politician but a true Statesman. That means he does not care what people think of him, he loves his country.and wants to do what is right for the betterment of the US and it’s people. Look at his record thus far-unbelievable. It’s so refreshing to have a leader in the White House that says what he means and means what he says,! !